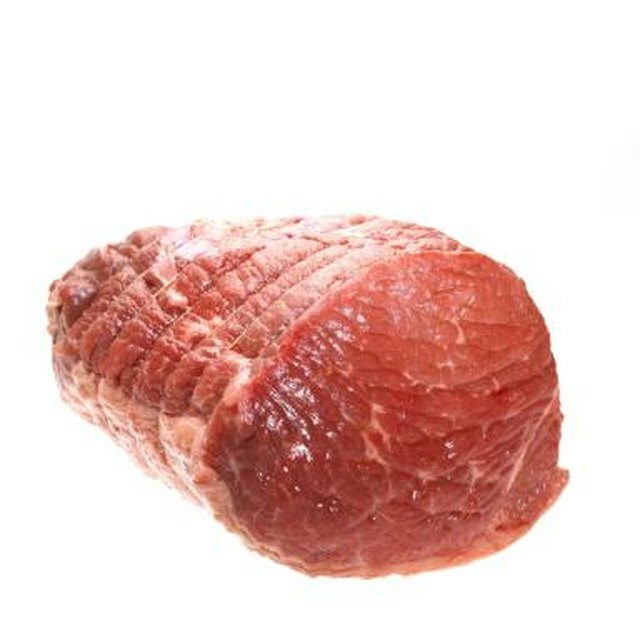 Select steak with a light, rosy red color, which indicates freshness. With its flat, rimless cooking surface, a griddle works well for cooking a succulent steak with a minimal amount of oil because the heavy metal conducts heat so well. Griddle cooking is best reserved for tender cuts, such as rib-eye or sirloin. Look for steaks with a light marbling of white fat to keep the meat juicy. 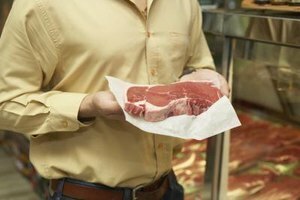 Round steak is a good choice if you're on a budget, but although the steak is juicy and rich in flavor, it tends to be a little on the tough side. Heat the griddle for 10 minutes, or until it is evenly hot and the surface is smoking. Do not oil the griddle. Rub the steak with a garlic clove cut in half, then coat both sides of the meat lightly with olive oil. Sprinkle the steak lightly with salt and freshly ground black pepper. Cook the steak for 90 seconds, then flip it and cook it an additional 60 to 90 seconds to cook a rare steak. Safe temperature is a minimum of 140 degrees Fahrenheit with a meat thermometer inserted into the middle of the steak. For a medium-rare steak, cook the meat for two minutes on each side, then check the temperature, which should be at least 150 F. Add an additional 15 seconds on each side for a medium steak with a minimum temperature of 160 F.
Transfer the steak to a plate, then cover the meat loosely with aluminum foil and allow it to rest for three minutes. During this resting time, the juices settle into the meat and the temperature rises an additional 5 to 10 F.
Always turn steak with tongs. Don't use a fork because piercing the steak causes loss of flavorful juices. To accurately determine the temperature of a steak, insert the thermometer from the side of the steak so the pointed end is in the center of the meat. Cook only one or two steaks at a time to prevent the temperature of the griddle from dropping.